This instrumented vehicle is able to find moving objects with very high accuracy in high traveling speed. 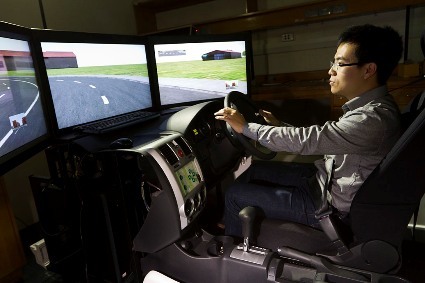 The driving simulator is used for studying human behaviour in traffic systems. The complex modern problem in transport engineering requires high performance and cloud computing facilities. These facilities are developed as part of transport laboratory at Monash. A small scale biological lab to use animal as proxy to human crowd motion is established as part of the transport laboratory. This facility is used for quick and accurate mass data collection of traffic and transport systems.